Rupali Bank Job Circular 2017 Officer Cash | erecruitment.bb.org.bd. Rupali Bank has published a job circular for the post of Officer Cash (General) on 17 July 2017. A total 200 Officer will be recruited through this circular. The interested candidates will have to apply through online by 8 Aug2017. Rupali Bank Officer Job Circular 2017 and detail application instruction will be found here. Job Description: Rupali Bank Limited is looking for a few young, skilful, creative and self-motivated individuals. Educational Qualification: Masters degree/ Four year honors degree from a reputed university in any subjects with minimum second class/division. Third class/division in any examination will not be eligible. Rupali Bank will recruit Officer Cash through MCQ, Written and Viva Examination. Rupali Bank Officer Cash Exam Date will be updated here. Rupali Bank Officer Cash MCQ Result, Rupali Bank Officer Cash Written Result, Rupali Bank Officer Cash Viva Result will be updated here. Like Our Facebook Fanpage facebook.com/resultnotice to get the latest updates of Rupali Bank Officer Cash Job 2017 and get further updates. 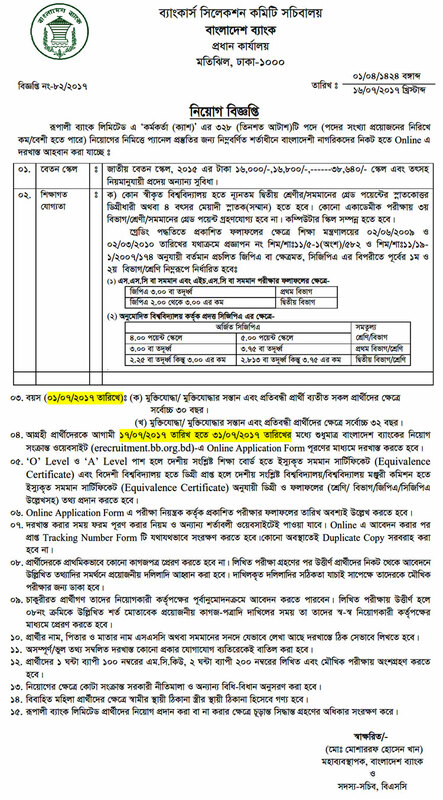 This entry was posted in Bank, Job Circular and tagged erecruitment.bb.org.bd, Rupali Bank Job 2017, Rupali Bank Job Circular 2017, Rupali Bank Officer Cash Exam Date, Rupali Bank Officer Cash Exam Result 2017, Rupali Bank Officer Cash Job Circular 2017, rupalibank.org by Result Gov BD. Bookmark the permalink.